Individual anthropometric measurements build the basis for a wide range of applications such as custom clothing or biometric identity verification. The possibility to extract these data automatically from 3D body models is therefore from high importance. Within the ‘Body Analyzer’ project a body scanner has been developed that is not only precise but also robust and manageable. In this project, a body scanner has been developed, which is distinguished from its competition by its precision, robustness and manageability as well as the addition of an analysis component as a body analyzer. The required hardware for capturing the data is thereby reduced to a single camera. 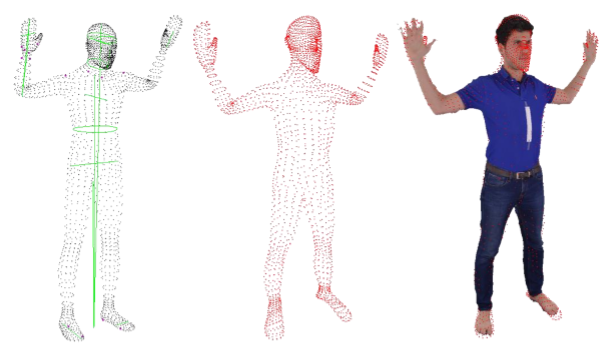 A visual body scanner reconstructs a closed 3D model of a person from different camera views. These views can be obtained on the basis of a camera by rotating the person in front of this camera around its own axis, or by moving the camera around the person. If a depth camera is used, recent filter and global non-rigid registration methods are used to transform the recorded data into a consistent body model. Such systems have already been developed and published in the past. However, these systems have some limitations in precision, detail, and robustness that have made practical use difficult to date. In this project, the limitations were largely eliminated by the joint use of color and depth information, and the system was expanded to include a cost-effective, non-technical body analyzer by supplementing an analytical component for extracting anthropometric measurements. Therefore, the project proposes a new method to define anthropometric measures once on a generic template using landmarks. After the initial definition the template can be registered against an individual body scan and the landmarks can be transferred to the scan using a new proposed algorithm. Exemplary extracted measurements are displayed in the figure above. Further detail regarding RGB-D reconstruction and non-rigid movements (Link) and Precise and Automatic Anthropometric Measurement Extraction using Template Registration (Link).